The hospitality industry is a major component of Southern Arizona’s economy and, as a recent Arizona Daily Star story informed us, is poised to grow. This is why I was pleased to read about our top-quality Hotel and Restaurant Management (HRM) program in the Sept. 5 edition of Inside Tucson Business. The article notes that we have dedicated space in our new Northwest Campus building to HRM. In the new space we have two classrooms that each accommodates over 25 students who get real-life training at the space’s hotel front desk, bathroom and bedroom. As lead faculty member Armando Trujillo notes in the story, the hospitality sector offers opportunities for employment around the U.S. and around the world. Through our program, we offer students a chance to embark on a truly global career. This entry was posted in Uncategorized and tagged careers, global, Hospitality, Hotel and Restaurant Management, Northern Arizona University, Northwest Campus, transfer on September 8, 2014 by pimachancellor. It was my great pleasure last week to attend a welcome reception for Dr. David Doré, the new president of our Northwest Campus. David is a top-notch addition to Pima, with nearly three decades’ experience in teaching and community college leadership. David’s wide-ranging background serving students, combined with vast administrative expertise, will serve the College well. At last week’s reception, David shared his vision for forging partnerships with the K-12 and university systems and with the business community. He spoke about working toward Pima’s overall goal of creating a student-centered institution and keeping students engaged to enhance their opportunities for academic success. It was particularly great to hear from David that every person he has met at the Northwest Campus has talked about students and how much they care about students. David, who started on July 1, comes to us from Mesa Community College where he was the Dean of Instruction for Career and Technical Education (CTE). Since July 2013, he has been responsible for 150 degree and certificate programs and also oversaw the newly created Arizona Advanced Manufacturing Institute. David plans to use this expertise to help determine what types of new CTE programs might best serve the Northwest Campus and this region. David holds a Doctorate of Education from Pepperdine University, a Master of Business Administration from Georgetown University, a Master of Education from Boston College, a Master of Theological Studies from Santa Clara University and a Bachelor of Arts in Philosophy from Gannon University. In our search for a new president of Northwest, the search committee wanted to find someone who is passionate about students and passionate about the community. Without a doubt, David meets those criteria. And please mark your calendars, a welcome reception for Dr. Erica Holmes, our new Provost and Executive Vice Chancellor for Academic and Student Services, will be held Monday, July 21 from 3:30 to 5 p.m. in the lunch room at the District Office. Hope to see you there. This entry was posted in Uncategorized and tagged Dr. David Dore, leadership, Northwest Campus, student engagement on July 14, 2014 by pimachancellor. This won’t come as a surprise to anyone but it needs to be stated: I am very proud of the new instructional building on our Northwest Campus. The gorgeous addition to PCC’s newest campus was dedicated Thursday at a ceremony attended by about 100 business and community leaders, as well as PCC students, employees and Board members. 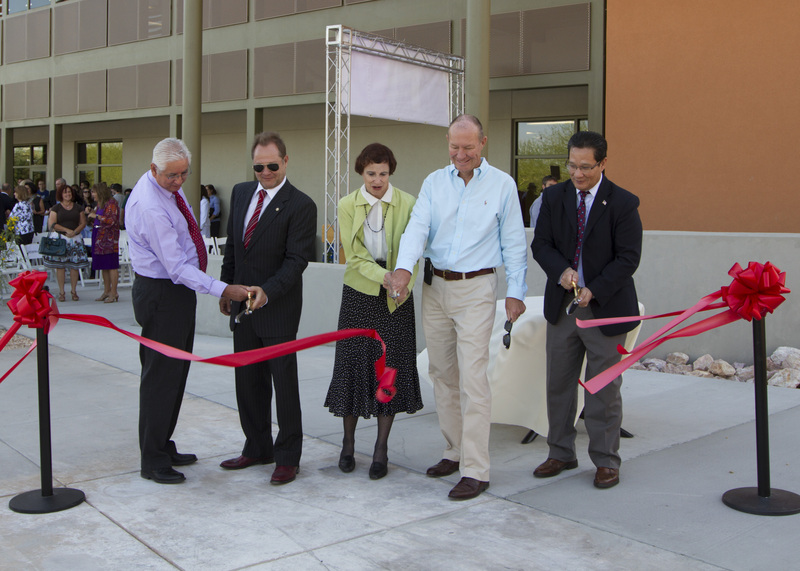 The brief ribbon-cutting ceremony marked a significant milestone for the Campus and the entire College. The building is a true gem. Designed by the Tucson firm of Burns Wald-Hopkins Shambach Architects, it features flexible learning spaces that can be configured to meet individual classroom needs. It has expanded space for Northwest’s Hotel and Restaurant Management and Clinical Research Coordinator programs. The dedicated lab spaces for mathematics and the sciences are truly state-of-the-art. The building will strengthen and build on our ties to our K-12 partners, to our community partners, to our university partners, and to our business and industry partners. Its classrooms will serve the entire community as PCC grows its high-need Science, Technology, Engineering and Mathematics (STEM) fields to support southern Arizona’s workforce. What is true for Juan is true for many who attend PCC. I noted at the ceremony that our Northwest Campus is a favorite location for adult learners preparing for their high school equivalency exams. We are striving to make all of PCC a place where everyone, regardless of where they start, can progress on their education journey. The Northwest building is our newest center for students to achieve their goals. It will help positions PCC to our community well into the 21st century. This entry was posted in Uncategorized and tagged labs, Northwest Campus, STEM, workforce on April 25, 2014 by pimachancellor.